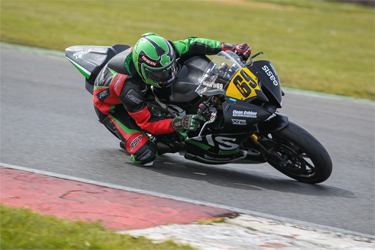 Donegal Motorcycle Racing team, Irwin Racing, had the best weekend of their first ever season competing in the British Championship at Snetterton Norfolk this weekend. The team took their first outright win at the latest rounds of the Thundersport GB Championship as well as a total of six podium positions. The teams inaugural victory was achieved in the 600 Elite class by nineteen year old Caolán Irwin who bounced back in the best possible way from a poor weekend at the previous rounds of the championship at Donington Park. Irwin Racing also celebrated a successful weekend in the Aprilia RRV450 Championship where Caolán’s younger brother, fourteen year old Rhys, picked up a quartet of podium finishes to mark his return to form following an injury filled start to his year. Riding the teams’ Oasis Bar Letterkenny backed Yamaha, Caolán’s weekend began with eight place in qualifying which would decide the grid for the opening race of three. A strong run in Sunday’s first encounter saw him climb to third at the flag to record his and the teams first Thundersport 600 class podium. Fourth quickest lap in the opening race put Caolán on the second row of the grid for Monday’s race two and he carried his momentum forward from the previous day to pull off a fantastic maiden win, by three tenths of a second. The team did not have much time to celebrate however as they still had a third race to complete, for which their rider would once again start fourth. In his final race of the weekend Caolán fell foul of a change in weather conditions. As rain started to fall the Irwin Racing Yamaha rider was sitting second but he was caught out by the reduced grip and fell, only for the race to be stopped shortly afterwards. Thundersport rules did not allow Caolán to take the restart so the Kilmacrennan lad was robbed of the chance of adding to his maiden win. While Caolán was setting the 600 class pace Rhys Irwin was making significant progress in his first season on board his Oasis Bar Aprilia 450. Having struggled for pace at the opening rounds at Brands Hatch, due to an off-season leg Injury, and then been further injured in a start line incident at Donington, this weekend was the first at which the younger Irwin was approaching full fitness. Having qualified second for the Aprilia RRV450 class Rhys followed up by achieving four second place finishes from his quartet of races. With Rhys’s previous best finish being fifth, this weekend was a significant step forward for the young Donegal rider who is now looking forward to continuing his progress at the next Thundersport event at Cadwell Park at the end of May. Before then, Irwin Racing will make their Masters Superbike Championship debut at Mondello Park this coming weekend where both Caolán and Rhys will be chasing further glory, as well as an all important nomination in the Masters Championship ‘Young Racer of the Year’ award.